Memorial Services are held on the third Sunday of each month at 10:30 AM. For the complete annual list of Memorial Services please consult this page on our web site. The Church Newsletter is also posted on this page of our website every month. Charlotte Bergsagle was born May 9, 1934 on Lolland, the southern island of Denmark across a narrow strait of the Baltic Sea from Germany, where she was among the first to witness the invasion of Denmark by German troops on 9 April, 1940. Her family moved to Copenhagen during the occupation, and there she was witness to the arrival of General Montgomery at the time of the liberation by Allied forces in May 1945. She was trained as a social worker, in which profession she was much loved and respected. John Bergsagle and Charlotte were married by John's father Pastor Bergsagle (buried along with his wife in the Vang cemetery) in the chapel of Mansfield College, which was the Lutheran chaplaincy of the University of Oxford, where John was teaching in the Faculty of Music. John and Charlotte began their married life in England, where their children were born, first in Oxford and later in Manchester, before moving to Denmark, where John was given a professorship at the University of Copenhagen and Charlotte resumed her career as a social worker. They maintained a close connection to England, where two of their children chose to live, and also had close ties to Italy through the Danish Academy in Rome, where they frequently stayed and worked. Charlotte died at age 84, during the night between Whitsun and Whitmonday, on May 21, 2018 at about 2.30 a.m. Her sister in Law, Marion Twyman (Bergsagle) died on the 15th of August 2018. John and Charlotte were married fifty-two and a half years. Adriana Van Kats, the mother of Jan de Goeij was born on February 13, 1913 in a small village close to Gouda in Holland. She attended the Roman Catholic School and church in that area. Adriana later married Johannes de Goeij and they had four children - three girls and one boy Jan, of this district in Alberta. They raised their children during WW2 suffering the hardships of many of their compatriots. Nevertheless, as dairy farmers they were able to subsist on their produce and even assist those less fortunate with food from their production. The third child, a girl, contracted Meningitis when she was three months old. At age 4 she was sent to a school for the deaf run by brothers and nuns where she was not allowed visits from her family for the first six months. She then returned home regularly for holidays. When she was 18 she returned to live with her family and was an accomplished lip reader. She later married a fine husband and gave birth to a boy and a girl. Adriana raised her family in a spirit of faith praying before every meal and taking her children to church. Winston was born in July, 1915 to Philip and Minnie Jordan on a farm 4 ½ miles northeast of Millet. He was the third of three children; Harold being born in 1908 and Gladys in 1911. He went to school at Golden Glow until grade eight and then stayed home to help on the farm. The whole family was musically inclined and the children learned to play various instruments as entertainment in the evenings while growing up on the farm. In 1932, Harold, Gladys and Winston formed an orchestra and started travelling to the surrounding districts playing for dances and weddings. This lasted until 1942 when Winston enlisted in the Air Force and worked as a mechanic on the airplanes. He was released in 1946 and on March 14, 1947 married Erial Skjel. Erial grew up on a farm 2 miles west of the Vang church. Her grandfather Erik Skjel Sr. emigrated from Andres, Norway to pioneer the farm and was one of the founding members who helped build the original Vang church. Winston and Erial bought a ¼ section of land about 1 ½ miles southwest of the Vang church from Tosten Jevne and started a mixed farm with a few of everything; beef, dairy, hogs and chickens and garden! This narrowed down over the years until it was a cow/calf operation only. In the early farming years Winston continued to fill in as a drummer for local dances at weddings and New Year’s Eve parties. Winston became a member of the Farmer’s Union, a delegate for the Dairy Pool and an on and off member of the Vang Church Council. Winston and Erial had a premature son born in 1947 who never survived. After that came Bradley in October, 1949; Patty-Jo in September, 1951; Virginia in July, 1953; Maureen in April, 1956; Jeanine in November, 1958 and Marshall in July, 1968. Most of these children were confirmed at the Vang church. When Freeman Jevne passed away in 1964, Winston took over leading the Vang Choir. Patty-Jo and Virginia also started being pianists at the Church and singers in the Choir while they were at home. Winston and Erial continued farming until Winston passed away from cancer on October 14, 1984. This month our short biography will deal with Bill Kjos an important and beloved member of the Vang district. This month we commemorate the 20th anniversary of his death. To the kids who rode on his school bus he was always Uncle Bill. That school bus ride drew the district youth together into a lively community bond which in many cases has continued into later life. People seemed to gather around Bill and most days he could be seen having coffee with the school bus drivers after they had unloaded their cargo of lively kids. William Kjos was the only child of Elmer and Constance Maxwell. In 1951 he married Lorna Stansbury. Both Bill and Lorna were born in 1930. Their five children are Sherry Peters, Dennis, Joanne Jones, Doug and Jeff. As a young man Bill worked in Northern Alberta on a Seismograph crew. During that time his father Elmer was in a serious car accident at Mullin’s corner. Consequently Bill, the only son, returned home to take over the farm. His children remember chores on the typical farm of those times which involved growing grain and hay, range cows, milk cows, pigs, chickens and turkeys. Bill perhaps was representative of the last generation of truly mixed farmers. Community activities were a large part of Bill’s social life. He loved Baseball, played horseshoes and belonged to the trophy winning Vang Bowling League. In fact, the Kjos farm seemed to be a gathering point for many social activities. Kjos lane is remembered as the spot where the well known Vang Band would practice marching. Bill also belonged to many organizations such as the Sons of Norway and the U.F.A. Ralph Jevne and Bill Kjos were first cousins. Ralph’s mother Ida Kjos, wife of Andrew Jevne, was Elmer Kjos’ sister. Not only were Ralph and Bill related but also best friends. Bill and Lorna, Ralph and Irene were constant companion couples traveling to many places together including England, Norway and France. They once visited the Kjos family farm in Norway. Please join us on September 16th as we remember deceased family members and friends. Our memorial letter this month will focus on John Mullin as we commemorate the tenth anniversary of his passing away from this world. John was born in 1915 in Outlook Saskatchewan where his family farmed several quarter sections. One easily understands that the children were all duty bound to the heavy labor involved in managing a very large spread at a time when horses were the only mode of locomotion and traction. Consequently the boys did not have the leisure to complete their formal education. When John bought a half section of land in the Vang district in 1945 he put the age of horse drawn implements behind him and was later known to have 5 tractors in the yard at one time and to rent five extra quarters. His own three sons were able to pursue the formal training that was denied him. Rodney studied mechanics at Sait in Calgary, Wesley became a skilled carpenter and Michael studied meat cutting at Nait. John’s father was Irish and English and his mother a Norwegian emigrant from the U. S. In 1938 John followed a former Norwegian farm hand of theirs to the Wetaskiwin area. 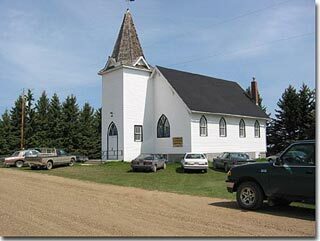 There he met Margaret Jevne and they were married in the Wetaskiwin United Church in 1939. Margaret recalls the cooperative aspects of their relationship as they worked together on a very successful mixed farming operation. They raised beef cattle, had dairy cows and as many as 40 sows. For five years they had 25 to 30 ewes and one year they kept as many as seven thousand laying hens. Margaret mentions that in all their years of farming they were totally self sufficient, never bought feed and all of their fertilizer came from their own farm production. Once they harvested a bumper crop of Barley that yielded 125 bushels to the acre. They also experimented with novel feed crops such as peas and fava beans. In 1965 Margaret and John moved out of their old house into the present home place which was a prefabricated dwelling hauled from Camrose. The couple, with the help of their three boys, worked hard at their successful farming operation and in 1989 received Alberta’s Farm Family of the Year Award. In July of that same year John and Margaret celebrated their 50th wedding anniversary. Alvan and Billy Beavo were the uncles of Janice Jevne. Alvan, who was a commercial artist, died in 1979. If Alvan came upon a sign that had weathered he would sometimes take it down and restore it at his own expense. Pilot Officer Billy Beavo was a member of the Royal Canadian Air force during the second World War. Following a bombing raid over Turin Italy on August 16th 1943 his plane never returned to home base. Later his remains were recovered from the English Channel, his body identified by an inscribed lighter that he carried on his person. His name is engraved on a monument in Great Britain. Billy was only 21. Evelyn, Janice Jevne’s mother, was the sister of these two men. Their parents George and Annie Beavo lived in Wetaskiwin where George worked at the N.A.D.P creamery and won a provincial award for his butter making skills. During the 30's at the height of the Depression George and Annie Beavo lived a couple of blocks from the railway line in Wetaskiwin and men who rode the rails looking for work would knock on their door asking for a meal in exchange for the odd chore around the house. George was born in the U.S. and grew up in Revelstoke where he later worked for the railroad. Before her marriage Annie was preparing to take a job in the hotel at Frank Alberta. Fortunately for her she was not there yet when that town was buried under a mountain slide killing everyone in it. George died on December 7, 1941 the day that the Japanese attacked Pearl Harbor. (January, 2011) We have some information about Vang, Norway in our website. Blaine Kjorlien visited the area in 2010 and has posted an article and photos under the 'Photo Album' link at the top. (October, 2010) We were privileged to receive visitors from Vang in Norway last September. Nils Rogn and his wife Kari-Birgit Lien spent some time in our cemetery and in the church with Blaine Kjorlien, Bert Lerohl and myself. Nils and Kari-Birgit had stopped in at the Wetaskiwin City Museum to inquire about Vang Church. The museum then phoned Blaine who happens to be a director there. Blaine went over to meet them and then brought them out here. Nils and Kari-Birgit said they live right beside the old Jevne farm at Vang, Norway. Nils Rogn had a Great Uncle Ole Rogn who was a founding member of our Church. Records show that he was a Deacon in 1899 when the Council first met. Ole Rogn had previously taken out a Homestead on the Quarter Section presently farmed by Brett Jevne. In 1905 Ole sold his farm to the Kvello family with the provision that he would continue living there until he died. He passed away in 1925. His name is now listed among the unmarked graves at the Cemetery Church Bell. In 1933 Ole's Homestead was purchased by Thomas Jevne, the father of Morris Jevne and Great-Grandfather of the present owner Brett Jevne. Vang Mission Outreach continues its endeavors in Guatemala. A group of Edmonton business and professional people have joined us in establishing a permanent endowment fund to help the Mayan Indians reach their educational goals. We expect that The Central America Mayan Foundation will be approved by Revenue Canada shortly. Scholarships provided by Vang Outreach have permitted 3 graduates of the Cunen College reach the Master’s level in Social Work, Education and Law. Recently 55 students have graduated with a Teaching Certificate and are able to begin working in the many villages that have not yet had the privilege of Elementary schooling. Ron Fengstad, our Outreach Director and I have had the privilege of living with Guatemalan families and studying their customs and the Spanish Language. For more details and photos of Vang and the work in Guatemala please consult our Web Site at www.wetaskiwinonline.com/vangchurch. We owe a debt of gratitude to Blaine Kjorlien for designing and maintaining this site. Incidentally, people who have consulted our site from Norway, the U.S. and elsewhere in Canada have been able to reconnect with their origins and attend our monthly Memorial Services. These Memorial events are always on the third Sunday of each month. Evan Theodore (Buster) Jevne, brother of Helen Dragon. First tank to cross the Gothic Line (tank blown up & Buster lay on the ground for 4 days) He was later among first 4 Allied soldiers to enter Hitler’s house. Henry Sehlin and 5 sons fought in 2nd W.W. Dad had enlisted at 16 for the 1st W.W. Son Donald died on March 31st in a Lancaster bomber.